Click any part of the sky in the above interactive piece to see how a sundial works. 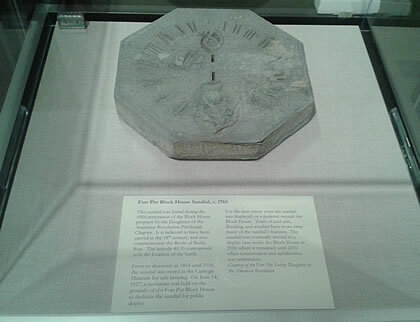 Recent image of the Fort Pitt Sundial as displayed inside the Fort Pitt Museum. Compare the look of the stone today with how it appeared when it was found at the turn of the 20th century. Credit – Fort Pitt Society. While restoring the Block House and renovating its grounds in 1894, the Fort Pitt Society DAR found a stone sundial on the property. The sundial, which is still part of the Society’s collections today, dates to the eighteenth century and is believed to be a commemorative piece from the Battle of Bushy Run of 1763. The stone is octagonal in shape, being approximately 12” x 12” in length and 2” in height. 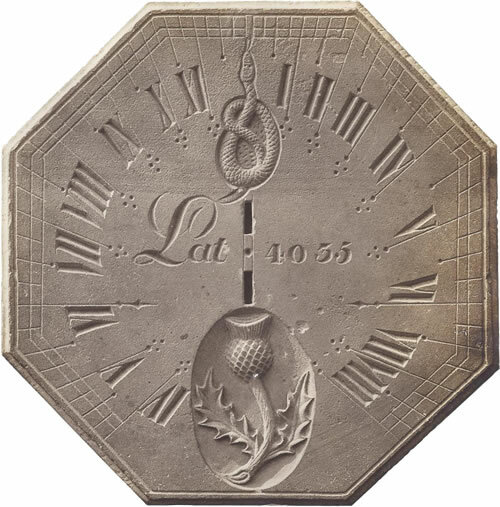 Its original gnomon is missing, but the front surface of the sundial features carvings including a serpent, a thistle, and the lettering “Lat 40 35.” Roman hour numerals from 4:00 AM to 8:00 PM are also carved into the stone. Measurement and analysis of the sundial hour line angles by Roger Bailey of the North American Sundial Society (NASS) shows the dial was originally calibrated for the latitude of Fort Pitt and even included a noon gap to correct for the thickness of the (now missing) gnomon. The “Lat 40 35” inscribed on the dial’s surface is actually the latitude for Bushy Run Battlefield, located fifty miles east of Pittsburgh. The 1763 date ascribed to the dial’s origin is coincident with the relief of the siege of Fort Pitt during Pontiac’s Rebellion in that year. The 42nd and 77th Regiments of the Highland Guard and the 60th Regiment of the Royal Americans defeated the Native forces (Delaware, Shawnee, Mingo and Huron Tribes) at the Battle of Bushy Run in August, 1763, successfully quelling the Indian uprising in Southwestern Pennsylvania. The Highland Guard is artistically represented on the sundial by the thistle and the Royal Americans by the serpent. Although the assignment of the 1763 date to the dial is not conclusive, the history of Fort Pitt, together with the design elements seen on the sundial and the location of its discovery, provides a plausible conclusion. 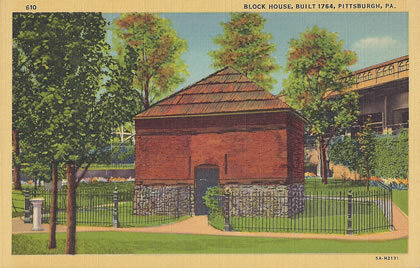 “Sundial pedestal – c1940” A postcard image of the Block House property around 1940. The pedestal holding the sundial can be seen to the far left of the image in the bottom corner. The sundial would have been under a glass case at this time yet still exposed to condensation and other damaging elements. Credit – Fort Pitt Society. Other than the obvious reason of commemoration, it is not known why such a sundial was created or who it was created for – or why it was near the Block House. The sundial was initially loaned to the new Carnegie Museum in Pittsburgh where it remained until 1916. It was brought back to the Block House property where it was put on display outside, open to the elements. Eventually a glass (and later Plexiglas) case covered the stone, but pollution and other damage had taken its toll. In 2006 the sundial moved into a display case located inside the Block House. It was professionally conserved in 2010 whereupon it was suggested to remove the sundial from the Block House and store it within the Fort Pitt Society’s collection space inside the nearby Fort Pitt Museum. Recently, in 2012, the sundial was put on display in one of the exhibits of the Fort Pitt Museum as part of a loan from the Fort Pitt Society. (Click here to see news coverage.) The sundial will remain as a semi-permanent exhibit in the museum where it can be viewed properly by visitors. The sundial’s face is grainy and light gray. The reverse side is an irregular brownish gray that features an arrangement of holes that formerly served to mount the dial; four smaller holes marked by rust stains likely date to the 1980s when the dial was placed on a new, square granite pedestal. The dial face may be covered with a slip coating that was carved to produce the dial features. Although the sundial is in poor condition today with its carvings hard to decipher, an excellent photograph taken between 1894 and 1900 shows the dial in good condition. This image has proven helpful in research performed on the sundial. “Sundial – original” Taken between 1894 and 1900, this image shows how the Fort Pitt Sundial would have appeared shortly after it was found by the Fort Pitt Society. The carvings and numerals are clearly visible and in good condition. The sundial’s surface was heavily damaged during the 20th century from being exposed to pollution and rain. Credit – Fort Pitt Society.